Time has a funny way of showing you who and what really matters in your life. And for that, I’m very thankful. When I met the godmother of our two boys, I never imagined she’d be in our lives this long. It was the summer before high school and we were both assigned to a pre-algebra course. We worked hard that summer, and really got to know each other. And after years of friendship, I never once questioned whether or not I made the right choice in making her the godmother of our boys. If you ever find someone who can really understand you at your worst, and cheer you on at your best, then you have a true friend. I’ve never considered her a best friend because she’s family. She knows all the drama in my family and I know hers — well, the ones she’s okay with sharing. But even that is okay with us. We understand that everyone needs their own privacy, and if need be, we’ll discuss it. No one likes to be compared to others, but honestly, I hope you find yourself a Meli. The thing about the godmother of my boys is that she’s always been a true friend. – doesn’t judge you because you’ve “messed up”. – accepts you for who you are and the things you love. – knows there’s more to the story when you’re being brief, yet doesn’t beat it out of you. – tells you the truth even when you don’t want to hear it. – makes you see all sides to every story. – doesn’t care if you haven’t called in a while. – will put someone in their place for you if they talk bad about you. – won’t entertain drama if it’s unnecessary. – will tell you to decide what’s right for you instead of everyone else. And most importantly, they’re the same wonderful person with everyone else. That’s what friends are for — at least in my eyes. I wish I had a friend like that. I am so bad at maintaining friendships and have lost so many people from my life over the years. I completely agree, The friends I have kept in touch with the most are the ones who live their lives and let me live mine and then when we meet up it's like nothings changed. I know they are there for me no matter what and I hope they know I am there for them. I love this, so heartwarming! We are all about lasting friendships at OUDH! Friends are those who are there when you need them. We dont always have time to be with someone as often as we should in the craziness that is life, but friends are always there! My best friend like this lives in Germany but it is so nice because when we do get together – it is like we have never missed a beat! I LOVE that list at the end. 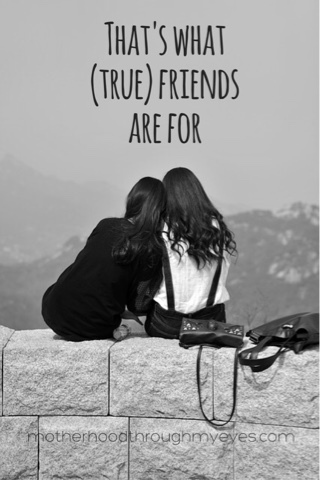 True friends seem like they are harder and harder to come by these days (what's up with that?! ), so I especially love that your friend has been in your life so long. Having a friend who is willing to tell you to straighten up as well as tell somebody to back off you is priceless. The person who listens for hours to the same thing and still acts like it's new news. I love friends like that and I love being one in return. I think you know when you have made a friend for life and if you have that gut instinctthen go for it. So lovely to hear how you guys became friends. I love friends like this. Friends that are so amazing, they are family. I have a couple of those. I love catching up with old friends. I live very far away from where I grew up, so it's extra special. Friendship, someone who encourages you and lifts you up. Distance has no boundaries for friendship!! I've found it's a lot harder to find friends like this than we think. I've reconnected with some of my oldest friends, and they really do all these things for me!! I have friends like these but I have found that the older I get I don't make as many "new friends" like I did when I was younger. Some of my friendships are over 25 years and the distance doesn't effect anything. My best friend moved away and it is so hard to make friends like that again. I can still call her, but the time in between gets longer and longer. I have moved so many times and lived in so many countries… but I am still in touch with some friends I made along the way. I think maybe friendship is feeling so close to someone you can not imagine them not being in your life even if they live in another country and you can't get together for coffee. It's a very special gift to find a friend like this. My husband is my true best friend. yep, i've got 3 great friends like this and would do just about anything for them 🙂 close, deep friendships are the most important thing to me. I wish I had a friend like that. I have friends and lots of close family but not a real best friend type of relationship.